What is the best way to enhance a small or regressive chin? The vast majority of chin enhancement surgery involves a small incision in the inside of the lower lip with placement of a silicone implant. Other materials can be used based on patient or surgeon preference. This procedure is quick and safe and provides excellent long term results. There are number of other ways to enhance the chin with fat grafting or bony modifications. Fat grafting allows for subtle improvements in chin while boney modifications with osteotomy (cutting bone) allows for a more aggressive advancement of the chin and in some cases modification of the dentition. Surgery can make the chin smaller, shorter, bigger, and longer depending on the patient’s needs. In most cases, it is better to under correct the chin than to over correct it. Patient can look at photos, diagrams, and review sizing charts to help determine the option that best fits their individual needs. During your consultation with Dr. Lowe (a board-certified plastic surgeon), measurements will help determine the surgery that is best along with the appropriate implant when indicated. During surgery the surgeon will use sizers to ensure the best results. In some cases, computer simulation or analysis can help patients with the process. In the end, after a thorough consultation the results depend primarily on the artistic skill of your plastic surgeon. The typical chin enhancement surgery is quick and straightforward. It is a surgery that even an untrained surgeon can perform. Nevertheless, it is important to pick a well- trained plastic surgery with aesthetic judgment to avoid looking “weird.” A typical chin augmentation takes less than a month to recover, but the chin usually takes additional weeks to fully shape due to swelling and redundancy depending on the technique. Most chin deformities are improved with an implant placed through the mouth or underneath the chin. Patients are encouraged to wear support and avoid trauma for several weeks. Chin implants can warp, displace, or harden over time, but most patients experience excellent and reliable for many years. Patients undergoing more complex procedures that addressing the bone or the dentition should expect a 6-8 months. Does a chin implant make sense? Surgery like life sometimes requires thoughtful consideration and sometimes compromise. Fillers or fat injection can be used to conceal small chin deformities. These procedures are also used to address aging or deep wrinkles of the chin or central neck. These agents can provide significant long term results in shape but are limited in the volume that can be achieved. Enhancing or repositioning deep structures of the chin with an implant provides more reliable results in most patients. Minor deformities of the chin can often be performed in less than one hour under light anesthesia. Secondary chin enhancement or revisions can be more complicated. The need for a chin implant is usually obvious, but in others it can be a difficult clinical and cosmetic decision. Patients should carefully weigh the pros and cons of chin enhancement (genioplasty) with a skilled board-certified plastic surgeon such as Dr. James Lowe. Dr. Lowe’s goal is to individualize care to ensure the chin and central neck looks the way the patient wants it to look. Some chin augmentations are combined with other minor surgical procedures such as neck lift or liposuction. Just because a patient has a small chin does not mean they will look better after surgery. 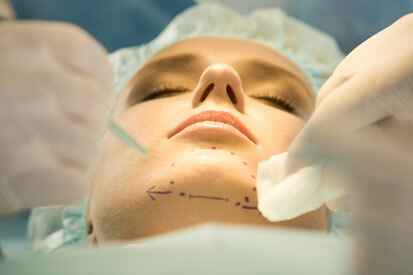 Although beauty is indeed in the eye of the beholder – bad cosmetic surgery is usually obvious. In some cases, it so prominent that it scares patients from even seeking consultation. The wrong procedure, performed by the wrong surgeon, in the wrong patient, for the wrong reason, causes the wrong result. After a full recovery, good chin augmentation is subtle and difficult to identify. Great cosmetic surgery is performed on patients who simply look better but not different. These patients rarely admit to the chin surgery and why should they?